Henry VIII's great warship, the Mary Rose, sank just off Portsmouth in 1545 and was rediscovered by Alexander McKee about 1970. It was subsequently excavated and raised and is on exhibit in the Royal Dockyard. A separate building houses a display of some of the material found in the wreck, which gives a remarkable view of Tudor life. In particular there are compasses, a log reel, a protractor, dividers, sand glasses among other navigational items and there are several game boards and dice, including a fine inlaid folding backgammon board. John Robertson (1712-1776) was master of the Royal Naval Academy, Portsmouth. He then became Clerk, and later Librarian, of the Royal Society. He was the first to show that stereographic projection is conformal. In 1775, he produced the first slide rule with a runner attached [Thompson]. A Napier descendent, General Sir Charles James Napier (1782-1853), the conqueror of Sind and half cousin to Admiral Sir Charles, is buried outside the west entrance of the Royal Garrison Church, Portsmouth [Greenwood]; [Greenwood]. Henry Moseley studied at a naval school in Portsmouth, c1818, and wrote his first paper here, On measuring the depth of the cavities seen on the surface of the moon. Donald Watts Davies (1924-2000) lived in Portsmouth from the age of a few months until he went to Imperial College. 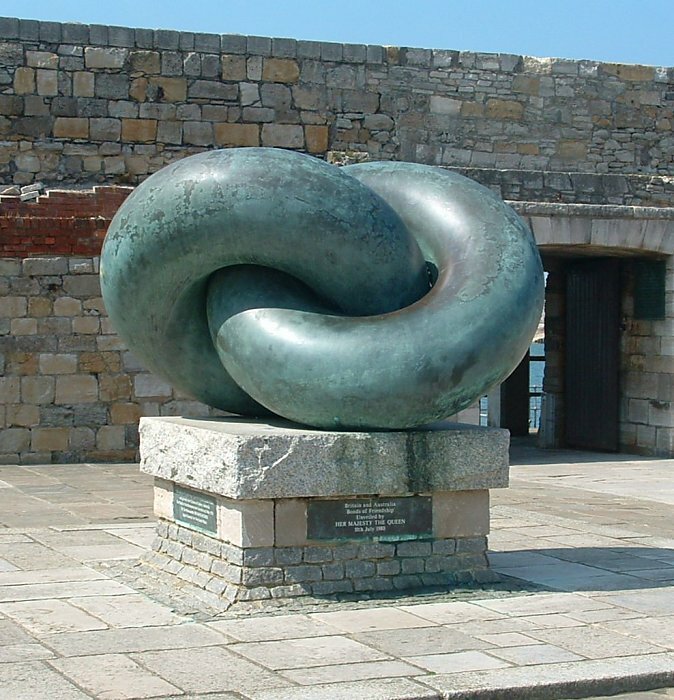 In 1979, a large sculpture by John Robinson, Bonds of Friendship, was erected at Sallyport, Portsmouth, the point of embarkation of the First Fleet of settlers for Australia in 1787. The sculpture consists of two interlocked tori, each just fitting through the opening of the other. It was unveiled by the Queen. An identical sculpture is at the point of disembarkation at Sydney Cove, Australia.